Today, I’m going to share a free hand embroidery pattern with you while waxing philosophical (actually, just babbling and pondering) about the names we give to visual works of art. This is a little drawing I’ve been playing with for a while, with the intention of using it as a hand embroidery design. And hopefully, some day, it will come about that I can work it into an embroidery piece. But in the mean time, I thought I’d share it with you! I’m really rotten at naming my embroidery projects. Normally, I think of them in the most general terms, and coming up with a clever name never even occurs to me. I call my projects very non-original things, like The Crewel Rooster, because… well, it’s a rooster. Worked in crewel. What else would I call it? Gosh, I don’t know. Nothing’s coming to me, even now. And I’m thinking So Hard! Hmmmmm…. Rooster. Morning. Noise. Barnyard. Those are the things that come to my mind. Maybe Rise and Shine? But wow, can you say cliché? So, after I drew this particular design and then vectorized it, I sent it around to my family and asked for some input on a name. Guess what I discovered? I discovered that the rest of my family is pretty much just as good at naming things as I am! But one of my nieces chimed in and said I should name the design after her – Juliette – and that’s how I came up with Fair Verona for this design. With a name like Fair Verona, you’d think the stylized flower would have some Italian flavor to it. Or maybe hemlock, or some kind of poison, is featured in the foliage? There’s absolutely no reason to call it “Fair Verona,” beyond the connection between my niece’s name and Shakespeare’s play. Oh, wait! The design is somewhat Jacobean. And if you consider that Shakespeare lived during that era – and composed Romeo and Juliet right in there somewhere – then yes, I think the design’s name makes a little more sense. I’ll keep it. My question is, how do designers and artists go about naming their works? I often wonder if there’s a formula. And why don’t visual artists name things the same way composers do? Piano Concerto No. 3 in D Minor. How easy is that? Of course, whose piano concerto no. 3 in D minor? How does that name differentiate any piano concerto no. 3 in D minor from any other piano concerto no. 3 in D minor? Didn’t anyone besides Rachmaninoff compose a piano concerto number 3 in D minor? But if composers do it that way, why can’t I? Why not Embroidery Piece No. 17 in Silk and Gold? It doesn’t quite have the same ring, does it? I’m obviously thinking too hard about this. After all, I don’t think Fair Verona is going to go down in the annals of art history, even if it ever does get stitched. And besides … what’s in a name? Here’s the handy-dandy PDF printable. The design prints at 6″ tall, if you choose “no scaling” or print at 100% on your printer. You can enlarge or reduce it to suit your preferences. 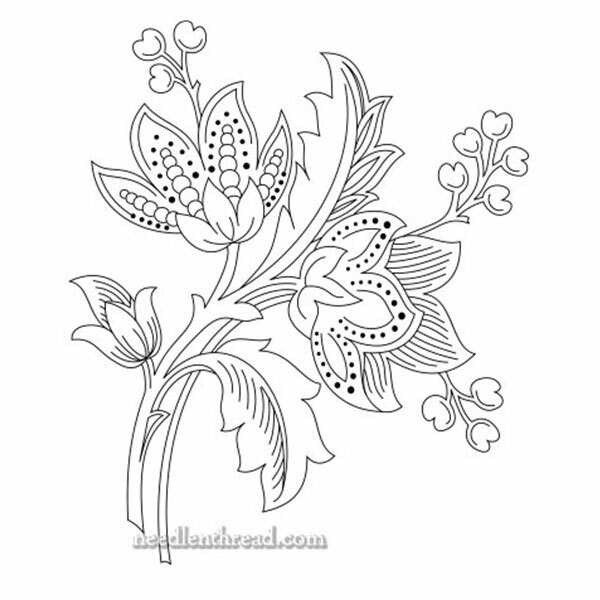 You can find lots of free hand embroidery patterns available here on Needle ‘n Thread, if you’re looking for more stitching possibilities! Check them out! Thank you for this. I believe this would be an excellent way to practice some surface embroidery stitches, even some of the ones in Hazel’s latest book. As to what’s in a name, you used the word FAIR in this one, which brings to mind light fair colors. I’ll think about it. Still need to finish my Tanja Berlin piece. But then, maybe this one. Interesting. I haven’t designed much embroidery, but I have designed quite a few pieces of modern bobbin lace. After gathering the threads I want to use (which may include ribbons and knitting wools), I find that the only way I can get my ideas to come together, is to name the piece first. The name seems to focus everything that’s swirling around in my brain and allows me to get started. Thanks for the lovely Fair Verona PDF and I think it is a fabulous piece by any other name (pun intended). Maybe the formula is just relax and let the “essence” of the piece inspire you; like thinking of your favourite place or piece of embroidery whilst enjoying the warm sunshine. Der, bit corny I know but it works for me. Good night and look forward to your next email. Cheers from a hot Queensland. That’s a very pretty design that will work up well in many techniques. Lovely design! I think “Fair Verona” fits it. I’ve seen paintings that were named with numbers, like “Study in Black and White No. 9”, which might make you wonder about the other 8 studies before you quickly moved on to something more interesting. I think taking the time and thought to give it a name adds a sense of mystery. Funny 🙂 Thank you for the pattern! ”… what’s in a name?” Oh, Mary! I love the way your clever mind works. Perhaps you could have named it Rose of Verona as a double tribute to Willy? Hi, Arlene – Adobe Illustrator is the “industry standard” for creating vector graphics (which is what you make when you want these types of smooth lines). Inkscape is freeware that does the same thing. Hope that helps! Mary, you poor, tortured soul!! Nice design! thank you! England? Anyway, just brainstorming. I have no complaints about the names you give patterns. “Cruel, Cold Dawn” for a rooster? Just teasing! Thanks for the design. I too that a file tucked away to play with “one day”!!! In my mind to name a piece – embroidery, textile art, sculpture etc, I always think gives it that little extra for me, gives it it’s soul! I always go looking for the name of a piece of work and feel a little let down if there isn’t one. Visual artists are no different to other creative souls when it comes to giving titles to their creations. Two could paint the same feather floating in mid air and one call it ‘Feather’, the other ‘An Angel Flew By’. A rose by any other name…. There is a folk dance called Flora MacDonald’s Fancy. This design could be embroidered on part of a costume for it e.g. a bolero. Might just do it myself. Generally my original pieces are named for what they are – 2011 Roadtrek ornament – for example. I did want to mention the Sondheim play “Sunday in the Park with George” In this play there are two different works of art made by 2 different artists in 2 different centuries. Both have named their works just what they are, no fancy title, just what the picture is of and this is his 7th chromolume. Also think – “Girl with Pearl Earring”. A lovely design, and very well named. Thank you for both the design and the Sunday morning smile. Thanks, Mary. I was unaware of how many gorgeous designs you have. They are amazing. Thank you, Mary, for the lovely pattern. It will adapt well to wool applique too. Your a constant source of inspiration – love ya! Hi Mary, been reading your blog for a long time, but never commented before. Beautiful design and you made me laugh about naming things. As a writer, I would say most writers will tell you a title for a story either arrives in an instant or they wrestle with finding it for months, and usually it’s the latter. You’re not alone. I’m horrible with naming patterns also! One of my first quilt designs, it was based off the tile floor at a restaurant named Blind Fish. So I named the pattern Blind Tiles. Hi Mary, this post made me laugh, because I can relate to the inability to name things, but in a totally unrelated way! I’m a bartender, and over the years I have created many new cocktail recipes, some of which turned out very nicely and became popular with my customers. Only problem….how do they order it? Or how do I write it down for a recipe box. Turns out I am AWFUL at thinking up names for my creations! I just draw a blank. So on occasion I’d mix up a batch, give out little samples and ask for ideas for a name. If anyone came up with a good idea for me to use, I’d buy them a full size version (or beer) in exchange. It worked! I guess nowadays that’d be called “crowdsourcing”! Thank you for your wonderful website, it is so nicely organized and your work is truly amazing! Thank you for taking the time to teach us all about embroidery, I love how in depth you get while somehow making it easier to understand! I love Fair Verona and your “philosophizing” in the naming process — fun!! thank you for such a lovely design. Following up on a reminder in todays post, I found this beautiful design. Thank you for your kind sharing spirit. As for naming your works. I am a quilter and sometimes designer. I love to name my original works. I’m also a list maker and have a handy notebook where I store ideas. In that notebook there is a place to list quilt names as I think of them… (I also have a list of cute dog names). Sometimes the quilt name is related to the quilt itself. I’m currently working on a quilt with reproduction fabrics from the 1850’s to the 1950’s and it’s working name is Vintage Stories.. Try keeping a list.. it gets easier. Thanks again for all of your guidance.